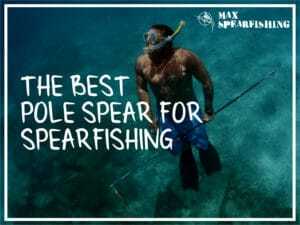 Home » Spearfishing safety. How to avoid a diving disaster. I’ve been spearfishing since I was 15 years old, a bronzed little Australian kid running around the beaches with a snorkel and a pole spear. In my time I’ve done some pretty silly things, and as I learnt more and started pushing my limits more and more, I realized just how important safety is when you’re spearfishing in the big, blue ocean. 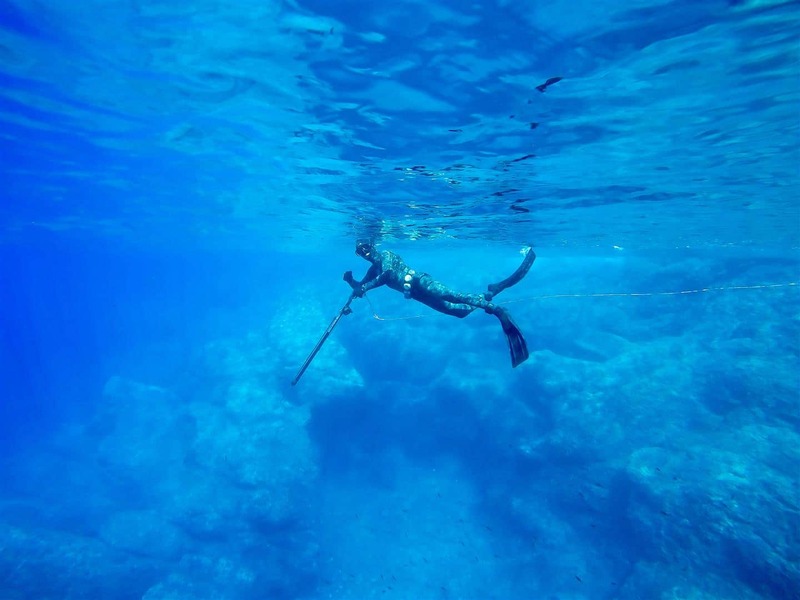 Today, I’m going to cover the guidelines I believe are critical for spearfishing safety. Break them at your own risk, because you won’t just be putting yourself in danger, you’ll be risking everyone around you as well. If you’re ever looking at the sea and thinking, “Oh wow it looks a little dodgy today,” it might be a good idea to call off your dive. I’ve lost friends who braved big seas in a little boat, never to be seen again. It’s just not worth it. When it’s rough, choppy, or the swell is up, don’t push it. The ocean is unforgiving to the spearo’s who don’t respect it. You also need to be wary of what’s happening in the area you’re diving. Strong currents can drag you away from the boat, or the swells hitting the rocks along the headland can be a recipe for disaster. Always pay attention to what’s going on around you, and don’t risk your safety just to catch a fish. Sharks aren’t the most dangerous thing in the ocean. Want to know what is? 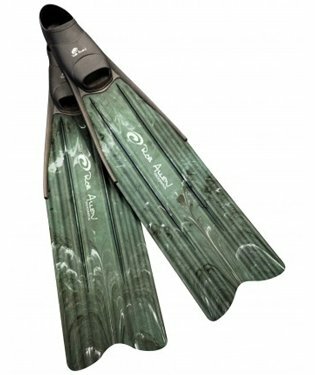 When you’re decked out in your camouflage wetsuit, with a camouflage speargun and a pair of black fins, you’re almost impossible to see. Especially if that boat’s heading into the sun, the driver’s checking their GPS, or even just cruising on autopilot as they trawl out the back. Always, always use a dive float and your flag when you’re spearfishing. They’re inexpensive, and with a big orange float following you around with a flag sticking up, you’ve got a much higher chance of being seen by another boat before you get run down. But aside from broadcasting your position there’s two other benefits. 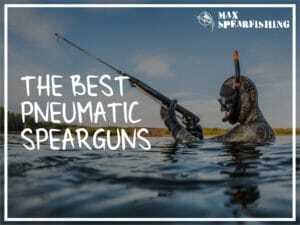 It allows you to drop your speargun and retrieve it later, like if you stumble across a lobster hole and need both your hands to pull those suckers out. Or if you lose your buddy. It’s easy to spot their float then follow the line down to their speargun, which could come in handy if you accidentally get sidetracked and need to track them down again. Ok, so maybe if you’re paddling around spearfishing in two foot water and the sea’s as flat as a board you can get away with it, and I’ve done so on many occasions. But once you start pushing the limits you need a dive buddy. 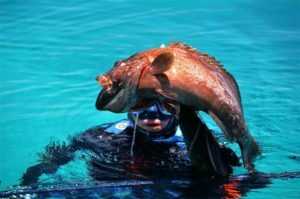 When you’re spearfishing deeper and deeper, staying underwater for long periods of time, or tackling more hazardous areas, you need a spearfishing partner to help you stay safe. 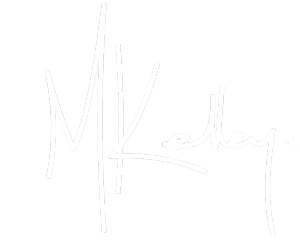 Your partner is your backup, and you need to work as a team. My advice, especially when you’re diving deep, is for your buddy to hang back on the surface and take turns with each dive. That way, if you need help bringing in a big fish, they’re ready to go. Oh, and if you push yourself a little too hard and black out, that’s when your dive buddy is going to come in real handy. When you’re diving as a team, one of the most important steps to learn is how to deal with a blackout (or a samba). Blackouts refer to falling unconscious underwater, while a samba is a complete loss of motor function. If you’re not ready to act immediately, it could have tragic consequences. 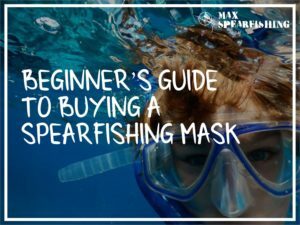 My advice is to take a spearfishing (or freediving) course, where you can practice exactly what to do, and you’ll also learn a number of techniques that will make you a better diver. If you find yourself in this situation you need to grab your dive buddy, quickly bringing them to the surface while supporting their head, and wait for them to respond and begin breathing again. It can take around 10 seconds in a shallow water blackout, and as long as 30 seconds if you were diving deep. CPR may be needed if they do not regain consciousness. 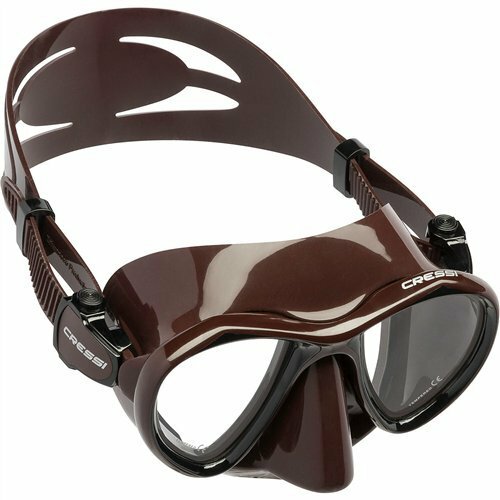 This one is just common sense, but it’s surprising just how many experienced divers I’ve spearfished with who have broken this cardinal rule. Now I love sharks and have a healthy respect for them, but clipping your catch onto your dive belt is plain stupidity. You do not want to be in the way when a shark comes in to grab the fish, as it’s a good way to lose a big portion of your torso. Always, always drop your fish back at the boat, or attach them to your float line that’s at least 30 to 50 feet away from you. It’s common sense people. In any adventure sport you’ll find gear that falls on both ends of the spectrum. Cheaper products made for beginners, and more advanced gear that you need once you start pushing your limits. 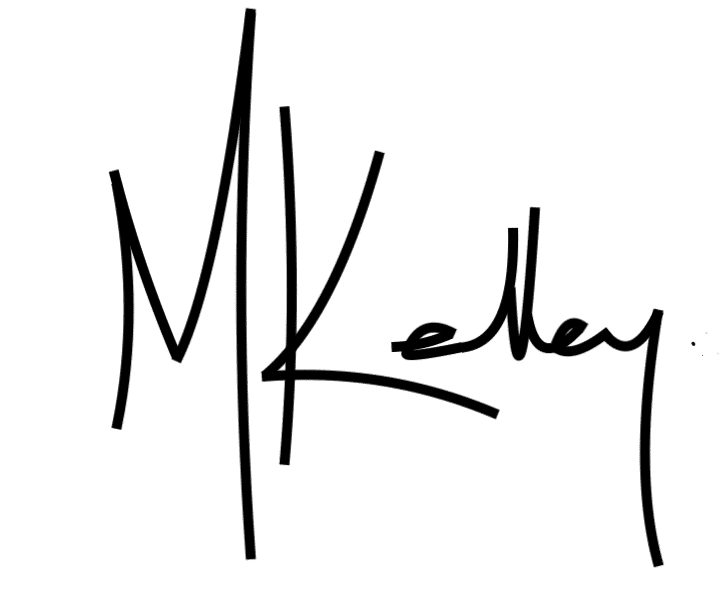 My advice is to be careful, know the limits of your gear and buy the right products. 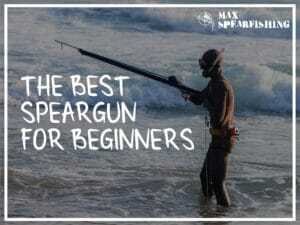 A beginner’s speargun probably isn’t what you want when you’re in deep water chasing big pelagics. 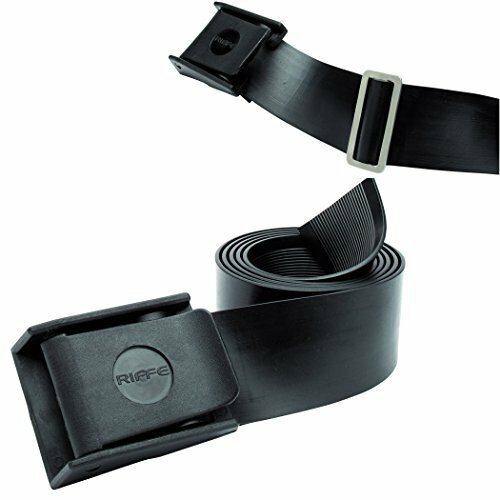 To boost the power you’ll have to get thicker and shorter bands, which will put too much pressure on the trigger mechanism, greatly increasing the chance it’ll misfire. 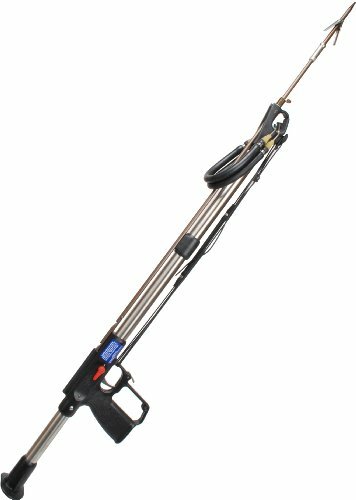 You need a big gun like a Rob Allen speargun. 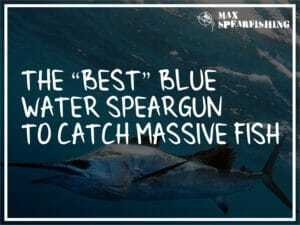 But if you’re splashing around a headland in just 10 to 15 feet of water, a cheaper speargun like a JBL is probably all you need to catch a bunch of fish, and have a great dive. 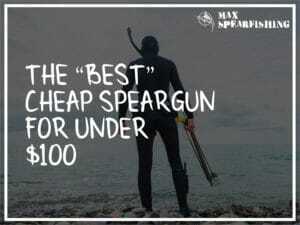 Always buy the right type of products for the type of spearfishing you’re planning to do, and don’t be afraid of investing in quality spearguns if you really need it. 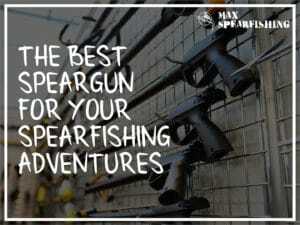 Spearfishing is an adventure sport. You’re out in the middle of the ocean, in the playground of some of the biggest predators in the world. There’s risks of course, but if you follow our guidelines for spearfishing safety, you’ll have a much better chance to make it home, and enjoy the big cook-up of fish with your family. For me, that’s what’s most important.